Childhood adventure is at the core of the story in this week’s new release The Florida Project. 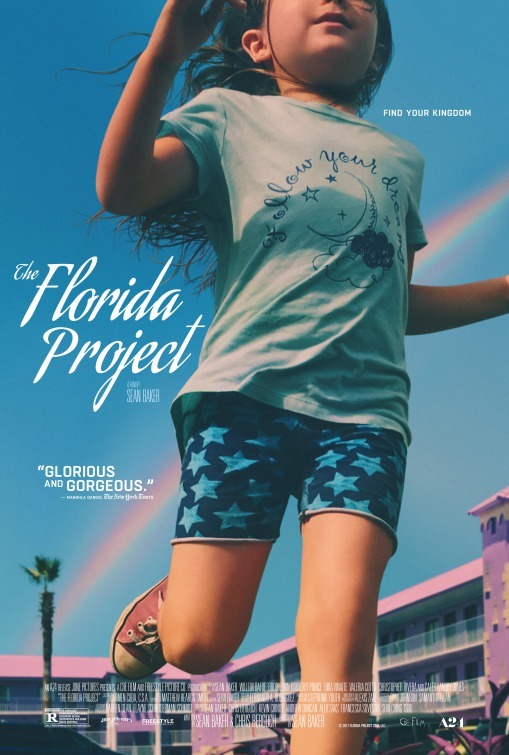 Written and directed by Sean Baker (who made a splash with the highly-praised Tangerine), the movie focuses on Moonee (newcomer Brooklyn Prince) who lives with her mother Halley (Bria Vinaite) in a low-rent motel just outside Disney World. Moonee is a free spirit with a rich imagination who turns every day into an adventure. She’s constantly exploring the area, which is decidedly seedy despite the presence of so many glamorous tourist attractions. Sometimes those adventures involve Bobby (Willem Dafoe), the manager of the hotel. The lengths Halley goes to in order to support her daughter become increasingly dangerous, though, which could impact the innocent childhood Moonee enjoys. The first and only poster shows Moonee running through the parking lot of the hotel where she lives, living her best childhood life, it seems. A rainbow streaks through the sky behind her while copy reads “Find your kingdom,” a nice nod to the setting of the movie. As the first trailer opens with Bobby lovingly scolding the kids for dripping ice cream inside the office of the Magic Castle motel. They leave complaining he’s no fun. From there we’re primarily following Moonee and her friends as they wander about from place to place on endless summer days. Bobby becomes concerned no one is looking after the girl when her mom Halley gets a new job. Things quickly return to Moonee and her childhood adventures, though. It’s…well…it’s kind of amazing. There’s no shortage of movies that are about childhood in some manner, but this one seems to double down on the idea that we’re not only following the kid but seeing the adult world from her perspective. That’s unique, as is the Florida landscape that’s captured on film here, the one that’s meant to appeal to tourists but is filled with locals just trying to make things work. The title treatment is the main element on the front page of the movie’s official website. Below that is a rotating series of quotes from early reviews praising the film. At the bottom are links to the movie’s Twitter, Facebook and Instagram profiles as well as a prompt to buy tickets. Accessing the menu in the drop-down in the upper left the first section is “Story,” which offers a brief synopsis of the plot. “Trailer” is next and just has the one trailer. Finally (with the exception of another “Tickets” link) is “Acclaim,” which collects more positive quotes from critics, though it doesn’t link to the full reviews. There may have been some online advertising done, particularly in the first markets the movie is opening in, but I can’t confirm that. A24 did boost the trailer with some paid promoted posts on Twitter and Facebook. Nothing on TV that I know of. A first look at the movie, specifically Dafoe’s character, came via IndieWire which also shared comments from Baker about why he shot in Florida again, some confusion surrounding the title and how he cast a good amount of the roles via social media or other unorthodox channels. Things went dark for a while until Baker spoke more about the movie, both its story and his experience making it, as it was about to debut at Cannes, which resulted in very positive buzz among attendees. That buzz lead to it being acquired by A24. Much later it announced it would screen at the 2017 New York Film Festival. It also appeared at the Toronto Film Festival, where it continued accumulating positive word of mouth and reviews. In the last few weeks both Dafoe and Baker have made the media rounds to talk about the movie, working together, what it’s like to shoot so close to the Happiest Place on Earth and more. Many of Dafoe’s interviews took unfortunate sidetracks into his work on the upcoming Aquaman movie, but that’s inevitable. The strongest thing this movie has going for it is the word of mouth that’s come out of various festivals and screenings. The critics who have seen it have almost universally loved the film, praising Baker’s writing and directing as well as the acting work of Dafoe and especially Prince, who anchors the film as Moonee. If that buzz can break out of Film Twitter and into the mainstream, it could help this small film become a box-office success. As for the campaign itself there’s a lot to like. The consistent use of the title treatment across media ensures a singular brand identity for the movie, no matter where people might encounter it. The variable is how widely those campaign elements have been spread and how many people have seen them. It’s a case where if they’ve seen the trailer and can be swayed by the critical praise, they’ll seek out the movie. Hopefully it hasn’t been buried by all the coverage awarded to bigger blockbusters. That’s just one of the movies called out in this New York Times profile of studio A24, which also includes mention of Lady Bird, Moonlight and a handful of others.